First published in 1982. 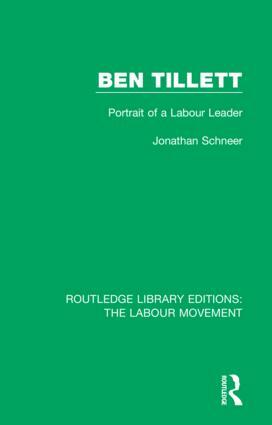 To study Tillett’s career is to study the modern British labour movement in its formative stages. His rhetoric and activities cast light upon some of the most important periods in labour history. In this book, not only the career of this remarkable and mercurial man is analysed, but our knowledge of the wider scene in which he played so major a role is increased. This title will be of interest to scholars and students of political history. Jonathan Schneer is Professor of British History at Georgia Tech and the author of a number of highly acclaimed books on British history including London 1900- The Imperial Metropolis, The Thames- England's River and The Balfour Declaration, which won the National Jewish Book Award. He lives in Atlanta, Georgia. This set of 44 volumes, originally published between 1924 and 1995, amalgamates a wide breadth of research on the Labour Movement, including labour union history, the early stages and development of the Labour Party, and studies on the working classes. This collection of books from some of the leading scholars in the field provides a comprehensive overview of the subject how it has evolved over time, and will be of particular interest to students of political history.